Tooling Blocks (pallet mounting) play an important role in ensuring the maintenance of precision during work. The blocks simultaneously provide more than one face for holding components accurately in a vertical plane. This makes it easy to machine on horizontal machining centers and prevents any movement while working. The specific construction of our tooling blocks reduces downtime by eliminating multiple setups. Every time a table is indexed, a new face with new components is obtained. This is what reduces the downtime. Pallet mounting tooling blocks allow multiple fixture plates to be loaded and unloaded simultaneously and this helps in reducing the overall setup time. The tooling blocks also find their application in vertical clamping of components on Horizontal Boring Machines, Milling Machines, Horizontal Jig Mills etc. 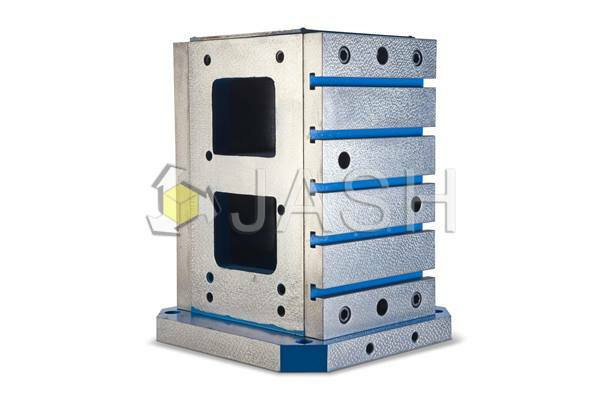 For custom requirements, contact JASH, the leading manufacturer and supplier of tooling blocks. Made from stress relieved plain close grained gray cast iron conforming to Grade FG: 220 of IS: 210 (equivalent to GG25/F T25/ 35-A). Higher grades are made available on request. Surface finish comes in Machined / Hand scraped variants. 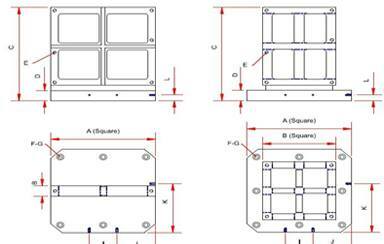 Suitable for mounting multiple fixture plates (Pallet) with different features. Bottom base can be made available with counter bored holes for fixing / clamping on machine pallet. Please request a custom quote for the same. Milled Tooling Blocks also offered with extra metal for final finish machining on user's own machining centers. This is made available upon request.